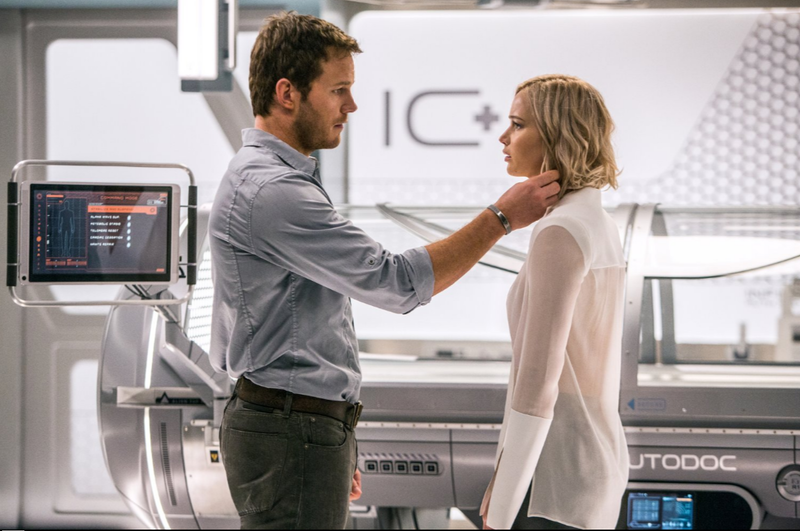 The visually stunning and completely engrossing "Passengers" is not only a great date-night flick, it's one of the best films of the year. Forget this month's other big outer-space movie. For a thoughtfully fascinating SF story featuring actual human drama, genuine suspense and an intriguingly improper romance, this is the one to see. 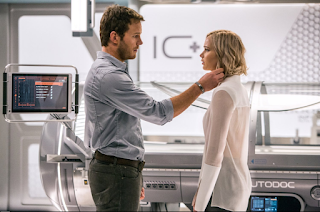 Chris Pratt is Jim Preston, one of 5,000 passengers and 258 crew members suspended in hibernation pods aboard a luxury starship bound for the distant planet Homestead II. A good-with-tools mechanic by trade, Jim wants a fresh start far from what the corporation that owns the vessel refers to as the "overpopulated, overpriced and overrated" Earth. Accidentally awakened only 30 years into the 120-year trip when the ship sustains damage, Jim is unable to return to suspended animation, or even to convince a computer interface that anything has gone wrong. Think of the technology nightmare of "2001: A Space Odyssey," but with very bad luck to blame instead of a malicious HAL. Pratt does a good job of showing the twin terrors of Jim's frustrating solitude combined with his maddening knowledge that he most likely will be dead before everyone else on the ship ends their hibernation at journey's end. His only conversation partner is the perpetually on-duty android bartender Arthur (the always enjoyable Michael Sheen), whose pleasantries-dispensing programming is of little use when it comes to discussing moral or existential issues. "Jim, these are not robot questions," he smilingly notes at one point, amiably dispelling any nagging similarities between himself and the creepy barkeep from "The Shining." Eventually, Jim's crushing loneliness leads him to awaken fellow passenger Aurora Lane (Jennifer Lawrence), even though he knows what a monstrous act he is committing by doing so. He also knows that the survival of their slowly growing friends-into-lovers relationship depends on Aurora never finding out what he did…which means that's exactly what has to happen (sooner rather than later here, thankfully). Director Morten Tyldum ("The Imitation Game") lets this deceptively simple plot expand into a moving metaphor about the need for forgiveness and acceptance in any romantic relationship. Tyldum also expertly ramps up the things-getting-worse tension as onboard systems continue to fail. Watching a futuristic Roomba repeatedly run into a wall is a surprisingly ominous sight. The Oscar-worthy production design by Guy Hendrix Dyas ("Inception") makes the starship's interior seem both elegantly spacious yet coldly intimidating. Spacewalks outside the massive, constantly spiraling hull are as awe-inspiring and thrilling as those in "Gravity." Two standout SFX scenes include the ship's up-close slingshot maneuver around a red giant star, and a terrifying display of what happens to someone unfortunate enough to be in a swimming pool when the artificial gravity cuts out. Other visual treats are Aurora's black jogging bodysuit and white mesh swimsuit, or Jim's bare backside, depending on your taste. Screenwriter Jon Spaihts, co-writer of "Doctor Strange" and Ridley Scott's "Prometheus," makes Jim and Aurora's personal dynamics as compelling as their frightening predicament, which is so rich with possibilities that it could have been a multi-part series. Although the movie is self-contained, it's not hard to imagine sequels that could expand on this universe and its characters.